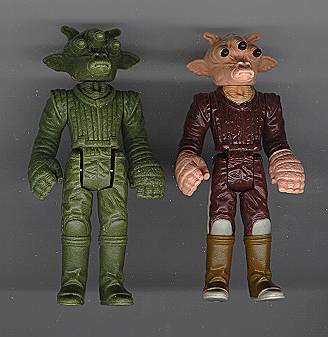 Differing from first shots in that they are handmade and pre-tooling, hardcopies represent the true action figure "prototypes" (when someone who worked on the Kenner line refers to a "prototype," they are usually talking about a hardcopy). They are made from silicon molds pulled directly from the wax or acetate sculptings, and are cast from a hardening compound which is poured in its liquid state into the mold cavity. In the late 70's to early 80's, a tan product called Carbalon was commonly used, with its replacement, the green Dynacast, replacing it and being used until about 1990. While the new, characteristically blue urethane materials have a durable, plastic-like feel to them, the earlier compounds are ceramic-like and easily-breakable, making it something of a miracle to find complete, unbroken figure examples now, 20 or so years after the fact. As you can see from the top photo, the hardcopy is a good deal larger than the production figure. This is due to shrinkage inherent in the injection-molding process, a fact of mass-production which must be forseen and accounted for in the sculpting stage. 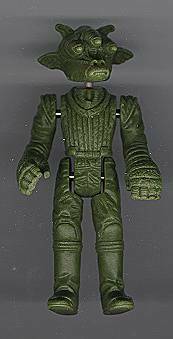 In general, hardcopies were used as pre-production samples for internal presentation and approval, regional presentations to retailers, and early promotional photography; paint masters which helped determine colors and deco schemes; working models demonstrating any action feature a figure might have (Boba Fett would have been the only Star Wars figure to have such an action feature); developmental aids in the creation of other parts of the figure; and, most importantly, as tooling masters for the creation of steel production molds. In all, around twelve complete hardcopy pieces might be made for each figure, a number which probably varied depending on whether or not hardcopies were needed for Toy Fair, an event to which multiple examples of each product were shipped in order to insure against breakage and loss. Today, far less than twelve of each figure have survived in hardcopy form. When hardcopies are found, they are usually incomplete, painted, or both, making this complete, unpainted example something of a rarity. As with all hardcopies, it is cast in solid pieces, meaning that the torso is not split into separate halves and that the limbs are attached by small metal pins which have been inserted into each joint. Unpainted hardcopies such as this one would have been used for tooling purposes, their three-dimensional forms being hand-traced by a stylus and translated directly into the steel of the production molds in a process called pantographing.